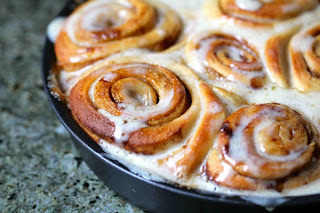 Today I'm still thinking about all of these crazy food cravings I've had over the past week (read: I want to shove warm cinnamon buns into my piehole). I want ooey gooey comfort sweets. I am well aware that on the healthy scale (1 being disgusto-level toxicity/10 being prima-perfecto-OCD cleanliness), these sweets (if homemade with local and organic ingredients) could be worse. The worst thing about them is the sugar content. Well, that and the fact that there's pretty much no nutritional value. But sometimes food has a different value. There are rainy-black-cloud, frosted-window days that beg for a creamy latte with a warm almond croissant for breakfast. There are the I-just-lost-that-job-I-really-wanted days that call for thin and crispy cornmeal crust pizza with plenty of cheese. And don't forget, the I-just-got-the-worst-news-ever kind of days, when you have lost your appetite altogether. Days like these do not call for kale chips. I don't care who you are and how you try to dress those little green babies up, it's just not in the cards. Day after day of pastries and pizza will of course not help in anyone's efforts to move towards a healthy (or happy) physique. But I say, indulge here and there (sorry, Dan, I ate the last jumble cookie) for a healthy and happy mind. Stay tuned for some upcoming posts about food: what to eat and why. PS. Instead of the cinnamon buns, I made some banana nut bread with minor alterations (1/2 the sugar, 1/2 the AP flour). Toasted with some almond butter, I think it came out pretty well. PPS. Check out my sweet board on Pinterest for some other crave-worthy baking ideas. Ah yes, some day are cinnamon-bun worthy. Bright sunny days give you the fortitude to try--and love- kale soup.